We are based on a private woodland site that is part of the Tissington Hall Estate four miles outside the market town of Ashbourne in Derbyshire. We are able to offer our programmes thanks to a partnership with the Tissington Estate. Tissington is one of the prettiest villages in the south Peak District and is also a convenient point of access to the Tissington Trail a thirteen -mile traffic free trail for cyclists, walkers and horse riders. These are our two small woodlands and are situated on the edge of Tissington Village. 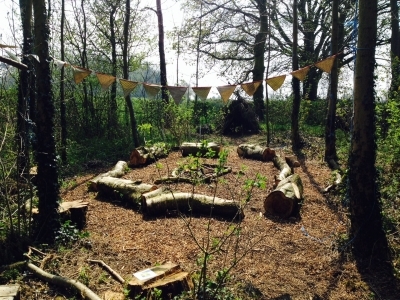 We think these woods are pretty special – they are magical places for children with lots of nooks and crannies to explore where they can have amazing adventures with their friends. Both woods are entered by a wooden gate and are for the exclusive use of visitors on a Tanglewood programme which means there will be no other members of public in the woods while your group is visiting. The woods have rustic log seating areas and circles with fire pits as well as canopies to provide some protection from the rain. 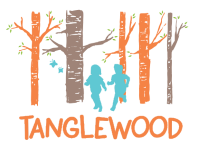 Both woods are a short 3-minute walk away from Tissington village hall which is available to book as part of a Tanglewood programme. School groups can be dropped off outside Tissington village hall and then cars and coaches can park at Tissington Trail car park which is 250 metres from the village hall. The Tissington Trail car park is managed by Peak Park Authority and has toilets that are open year round. Car parking charges apply. For birthday parties and other groups please park at the Tissington Trail car park or outside Tissington Hall and walk round to our woods which are an approximate 5-minute walk away. All school groups will automatically have the village hall booked as part of their visit. We aim to be outdoor as much as possible but in poor weather we can deliver games and activities inside the village hall as well as eat lunch. The village hall, which has been refurbished in recent years, has toilets and a fully equipped kitchen allowing us to provide drinks for the children and teas and coffees for our adult visitors.